Much of Fine Gael’s past is now of the stuff of history. Fine Gael is content to leave it … to the ultimate judgement of the historian. Lost leaders have a persistent fascination. The reputations of great men cut down in their prime are often more enduring than those who lived to make a real impact on their country’s fortunes. Kennedy — like Parnell — is an obvious example. One of the driving questions of a module that I taught at UCD asked ‘what makes an icon?’ The course was delivered to visiting American students and, in getting them to consider the question, I asked them to think of examples from back home. I taught that module on nine separate occasions and invariably someone in each group would mention JFK: a life cut short. And they also always followed up their example by adding that he doesn’t rank as one of American’s best presidents. Naturally, Michael Collins was mentioned in the Irish Times column. Assassinated at the age of thirty-one, he too fits that template. A romantic figure, cut down in his prime, questionable aspects of his career are, as Stephen Collins noted, conveniently overlooked. In contrast to the Kennedys, Parnells and Collins of history are leaders like W.T. Cosgrave. First President of the Executive Council (the forerunner of the Office of the Taoiseach), he led the government charged with the task left behind by Collins: that of building independent Ireland. It was essential, but it was not glorious. Cosgrave’s name is not revered in the way that Collins’ is. It’s long been a bugbear of mine that the Cumann na nGaedheal era receives only passing attention by Fine Gael. Granted, I’m biased. I specialise in the area — my history of the party was published in 2010 — and most historians have a tendency to think their topic ranks among the world’s most important! But what really rankles with me is Fine Gael’s selective approach (and yes, before the obvious is stated in the comments section below, I am aware that all political parties pick and choose from history). I feel privileged to follow the noble tradition set down by Collins, Griffith and Cosgrave and our many distinguished leaders since. The image chosen for the cover was that of W.T. Cosgrave. However, Cosgrave was not the first leader of Fine Gael — and we were there, after all, to mark the formation of the party — but rather he led Cumann na nGaedheal until 1932 and then returned to the helm in March 1935 only after Eoin O’Duffy resigned. When Fine Gael was created from a merger of Cumann na nGaedheal, the National Centre Party (a farmers’ party) and the Blueshirts, it was O’Duffy who was chosen to lead the party, not Cosgrave. 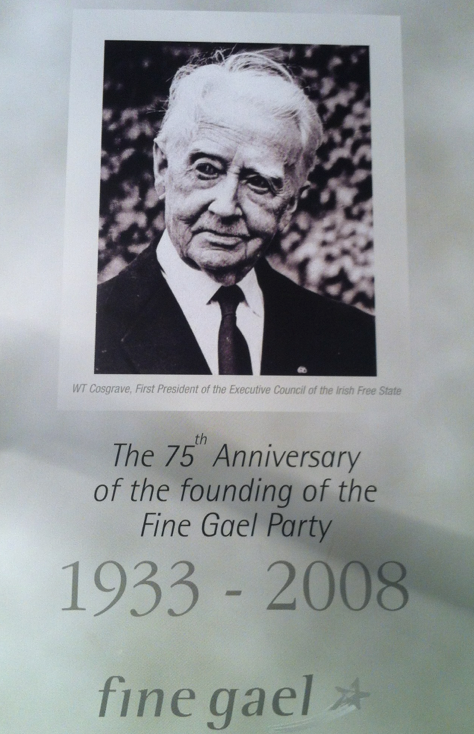 That Cosgrave’s picture was chosen for the leaflet is not surprising. The alternative was the party’s first leader, and Cosgrave is clearly more acceptable than O’Duffy — a man who will forever be associated in the public mind with the Blueshirts and the fascist movements that swept large parts of Europe. So why weren’t we there to also celebrate the birth of Cumann na nGaedheal? The case could be made that the line of continuity between the two parties is blurred by the inclusion of the farming element and the Blueshirts, and that 1933 marks not a political metamorphosis but actually the birth of a new party. But then, how is this reconciled with Fine Gael’s readiness to claim Michael Collins? After all, he was dead almost a full eight months before Cumann na nGaedheal was officially launched in April 1923 and certainly for several years before Fine Gael appeared. The ‘lost leader’, of course, is not tainted by the tough, and sometimes questionable, decisions made by Cosgrave’s Cumann na nGaedheal governments. A keyword search of any library database will return numerous titles relating to Collins. W.T. Cosgrave is still waiting for his first academic biography — the subject of the next offering from the Royal Irish Academy’s excellent Judging series, it is a book eagerly anticipated. Reading the tagline of the Irish Times article — ‘Heroic figures who did not have to wield governmental power remain popular‘ — I recalled an observation once made by Michael Laffan: in nationalist Ireland, it was more useful to die a bloody death than to pass away in old age in one’s own bed. At last year’s Fine Gael Ard Fheis, the leader’s address was preceded by images from the party’s past, which did include the Cumann na nGaedheal era — an attempt at a difficult time, perhaps, to show Fine Gael in the same ‘state builders’ mould as their predecessors? In general, though, it seems a shame that Cosgrave, who succumbed to old age at eighty-five, and his colleagues are left to the historians. My history of Cumann na nGaedheal — The Cosgrave Party — is available to purchase here. My Eire-Ireland journal article on Cumann na nGaedheal’s legacy to Fine Gael is available under the ‘Publications’ tab on this blog. Next Next post: Why study history? Ciaran Brady responds to Ruairi Quinn.